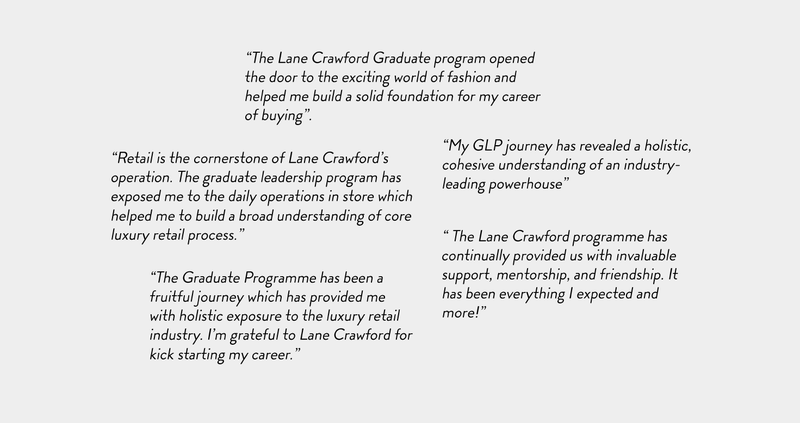 The Lane Crawford graduate programme is an amazing opportunity to develop your skills and experience the dynamic nature of world-class luxury retail. It offers a 24-month fast track for ambitious talent, with comprehensive learning and work exposure in your chosen business stream. The Product stream focuses on developing graduates who have a passion for a career in buying. During your rotation you will have the opportunity to work with the Fashion, Beauty and Wellbeing, Lifestyle and Jewellery teams; seeing our brands first-hand and understanding our buying business model. You will learn how Lane Crawford products are sourced from around the world, how we support new and emerging designers, ensuring a unique edit of products across business units. You will also spend time working in store and online to better understand our customers and operations. We welcome graduates who are self-driven, have an eye for detail and are genuinely interested in our world of Fashion and Lifestyle. Retail expertise is at the heart of Lane Crawford. During your retail rotation, you will be working very closely with our stores, online and retail office teams to deliver the best experiences for our customers. Your rotations will include PR, Marketing, Online Retail, Customer Contact Centre and other related departments, to enrich your knowledge about our World of Luxury Retail. We are looking for graduates who have great interpersonal and communication skills, are motivated and goal orientated, and whose career aspiration is to work in our retail stores. The Enterprise stream focuses on Lane Crawford business operations and management. Our Enterprise graduates will have the chance to rotate within Finance, Human Resources, Logistics & Warehouse, Technology and Customer Experience, all of which will deepen your business knowledge and ensure you really get to know the inner workings of the company. In addition, you will spend time in store operations. We are looking for graduates who are strategic, adaptive, flexible, team-players, and are excited to be part of a team which guides and manages the company’s business. While focusing on the key departments within your preferred stream, all successful graduates will spend time in our stores and online business, learning about our customers and how we deliver our world of luxury through service and loyalty. You will have the opportunity to collaborate with different departments on various initiatives, events, and special projects that are pivotal to your understanding of the business world, as well as your own development. At Lane Crawford, our values of Passion, Learning and Collaboration encapsulate our beliefs and ways of working. You will be encouraged to do new things, take on new responsibilities and need to have the courage to try and sometimes fail. In addition to our ongoing classroom curriculum offered through Lane Crawford Academy we also offer e- learning, accessible 24 hours a day through an online platform, internal and external inspirational speakers and business skills training tailored to your chosen stream. Throughout you will be partnered with a mentor from our leadership team who is available to offer you confidential coaching and guidance and you will also work with on-job coaches who will share their knowledge and experience with you. We welcome graduates who demonstrate energy and passion, who have a positive mindset and the drive to realise their full potential to be the future leaders of Lane Crawford.